Last weekend, I finished up the most important event of the first half of 2014. For me, the Miami Olympic Classes Regatta (OCR) had a massive buildup and anticlimactic end. It was a struggle to get organized for the event, as Murphy's Law was in full effect when it came to my logistics. This winter's bugbear, the Polar Vortex, also gave Miami some unusual and light conditions for the competition. I came home in early January from Cadiz with a good plan for Miami. I had a boat, coaching, and accommodation set up, and I was feeling confident with my training both on and off the water. However, even the best laid plans aren't totally set in stone. When I got home to Annapolis, my boat arrangement fell through due to an insurance concern. Luckily, I was able to find a boat from the Severn Sailing Association that I could tow down to Miami! On the day I was supposed to leave, however, I got really sick with flu-like symptoms. Being stubborn, I naturally decided to start driving anyway. It took me about 18 hours to get just to Georgia because I kept stopping every hour to sleep (normally, 18 hours would bring one to mid-south Florida). After arriving, I found out my Spanish coach and training partner couldn't make it to Miami because they both got pneumonia and were in the hospital. I had to scramble a bit to find a different coach. To top off this excitement, the transmission in my minivan decided to suddenly quit, and I had to take it in for a complete and expensive rebuild. The Polar Vortex also played havoc with the regatta conditions for almost two weeks straight. The weekend before the OCR, the boards competed in the "RS:X Nationals" warmup regatta. We experienced very light and shifty westerly conditions, and I discovered a real strength. We had long days on the water because we shared the course with 470 and 420 fleets, and the unstable wind created a lot of recalls and waiting. Our races were also longer than usual, and at 35-45 minutes each, it meant a lot of pumping and physical effort. Physically, I held up well and was able to recover between races and at the end of each day. Now that my technique and fitness are working together, I was able to sail some excellent races focusing on tactics. I finished third, very close to second, only due to a non-discardable black flag in part to race committee error. We experienced similar conditions for the first two days of the OCR, except the southerly directions were slightly less shifty. I performed well tactically and physically during these days, and was quite happy with my consistent results. After one day off due to thunderstorms and light wind, we were back in action with three more races in 8-12 knots. We had about 7 starts for the three races because the wind shifted so many times! I didn't have as good of a day, although I was doing some good things on the course. The next day, of course, there was no wind again, so that left the fleet only with the medal race. I was disappointed with some aspects of my performance in the medal race. Although I had a good start and positioning on the fleet, I and two other girls were fouled at a tight windward mark rounding by a French sailor who had to double tack to get around it in the fairly strong current. This put me back, and I made one more mistake on the second upwind that dropped me to second last, which was really disappointing as I had the chance to move up into 5th place. I am happy to say I am back in my #1 spot on the team, and I've qualified to go to the Rio Olympic Test Event this summer. Even though the OCR was a little crazy this year, it was a good test to evaluate my performance under outside pressure. I have come away with many things to work on, both on the water and mentally. My next steps are uncertain at this point, because I am in the process of finding a new training and coaching situation. There is a lot of work to complete logistically, financially, and training-wise this month, but if there is anything January taught me, it's that I can handle whatever complications come my way and come out on top. 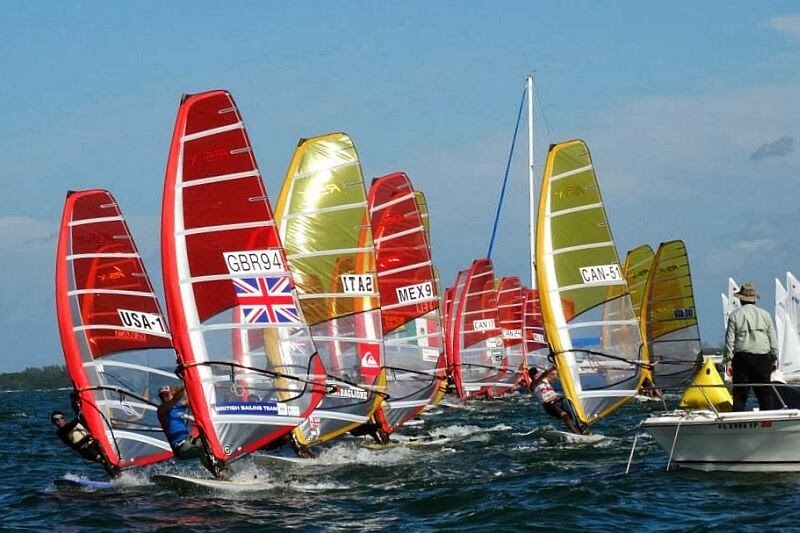 I'm confident I will create a strong plan over the next few weeks, and position myself where I need to be at the upcoming ISAF Worlds and Rio Olympic Test Event. I realized after writing this that I don't have any pictures of myself at the OCR. To make it up, here's a short clip of me sailing around with the city in the background...you can also laugh at my war paint at the end of the clip. Eye black does work to absorb glare off the water.